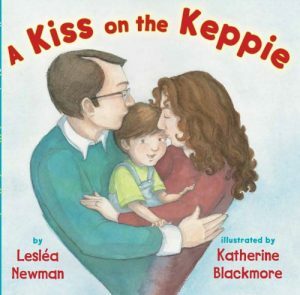 A small child gets a kiss on the “keppie” (affectionate term for “head”) all day long from his parents, his grandparents, and even Dreidel the pup! I wanted to write a warm, loving book that expressed the love I was given as a child by my mom, my dad, my grandparents, and even my dog! From morning ’til night, the child in the book feels he is loved and cherished, just like I did when I was a child. as Mama wakes you in your warm little bed. from Papa whose arms are so cozy and snug….